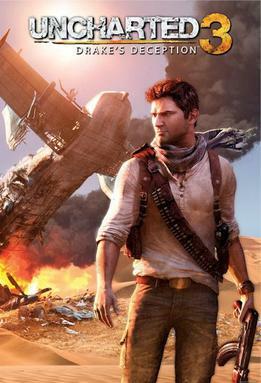 Uncharted 3: Drake's Deception is a action packed shooter/adventure/platform game. It follow's the adventures of Drake, a thrill seeking archeologist, basically a male Lara Croft. He's kitted out with all the biggest and baddest guns. No matter how many people are trying to kill him he always prevails. Uncharted contains alot of violence and some blood. It can be a little scary at times but nothing too bad. I do recommend this game because of the immersiveness of the story and the mutliplayer games.